Kate Box's colourful knitwear in the shop now. It's a very wet week. That means people aren't out and about shopping. This time last year I was making the best money of the year. But this year what with the rain and b___ Brexit not to mention internet shoppping, Handmade Happiness along with every other shop in the UK is struggling to survive. 2018 has been the toughest year so far! Every day visitors tell me HH is a beautiful shop. Every day people say they wish they could buy everything in the shop and every day people say they'll come back when they have more time. Oh yes and every day people say they are cutting back on Christmas spending this year. And the weather forecast says rain next week as well! Ok enough moaning! Today could turn out to be the best day of the year in HH and if I didn't always think optimistically I would have closed down long ago!! On Monday afternoon I went to Gunwharf Quays and really enjoyed looking round the outlet stores there among the sparkly Christmas lights! Years ago when I worked at a Petersfield shop called Tricot Too it stocked a clothes brand called American Vintage. Soft cotton clothes I always admired in timeless styles. So I was pleased to see they've now opened an outlet store there. Although, before you get too excited, the prices are quite a bit higher than prices at the nearby Marks and Spencer outlet store!! 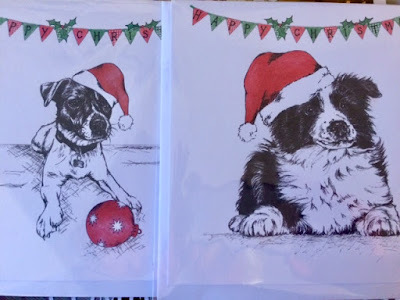 Handmade Happiness has lots of her Christmas cards, each showing a different breed of dog. Kate Box's lovely knitwear always makes well-received presents. Right now HH has a good selection so come in and have a look. These are what I bought!